When stock markets are stable its much better to short options than to buy even though VIX is low. India VIX fell sharp today by 5.75% and closed at 18.02. I have a feeling that stability that we were looking for since the last two months has come. In that last few weeks a 1% or more movement was very common. One day up next day down – very frustrating for buyers as well as sellers. When markets are stable traders can do some planning, but when its not, there is no plan. Every time you take a trade stop loss is hit. Buyers take a stop loss one day, next day its turn of the sellers. Stable markets are best for option traders especially the sellers. We will shortly know why. This again is very uncomfortable situation for buyers. When you have VIX above 20, you just pay too much as premium of options. In my view its not justified. If you are buyer and not comfortable paying a big amount for premium – just don’t bother trading. No one is forcing you to trade. I do not trade if I am not comfortable with option premiums. Whether buying or selling, if I am not comfortable with a trade I will not trade. That’s it. VIX was not falling because of multiple reasons, but the main reason was no clear solution of China issue. Now that its over and markets have got some good news, we may look forward to a stable market at least for a couple of months. 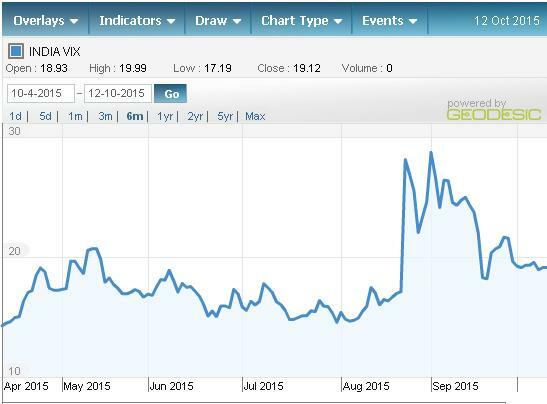 Can you see how VIX behaved since 24-Aug-15 (the day China slowdown news broke out and Nifty fell 6%) till 24-Sep-15? Before that VIX was averaging 15. People who took my course made good money all this month until 24th Aug struck (some people made good money even on a fall) and we were on our toes for about a month. Now again the clouds have cleared and its time to make money. Here is a peace of advice: If you can identify these troublesome months and stay away from trading your returns can be amazing in a year. I agree though its very hard not to trade and also identify the troublesome months – but if you can stay away from these volatile months it will be great for your account. VIX is a great indicator of trouble in markets. Hope you remember I sent a warning message on September 1, 2015 when VIX crossed 30 and I asked all of you to halt trading. During volatile times the directional trades works best. Those who traded made money. VIX Was High, Did Option Buyers Make Money? I feel now VIX will come down and get stable. Because historically Indexes are suppose to trade in range 80% of the times thus favoring the sellers. Yep 20% the times the markets have to favor the buyers for poetic justice, but I seriously doubt last 1 and a half month buyers made any money. If you are an option buyer please be honest and let us know in the comment section if you made money last few weeks. If yes, was it significant like above 30% of capital traded? If no this was your best time to make money and if you failed during these times too, then Good Luck more though times ahead. August to September 2015 were buyers months. If you were unable to make money buying options during these months – then I bet you cannot make money buying options. Close your account and keep them in some liquid fund. Now VIX and Nifty are getting stable and it will be even more difficult for you to make money. Please do not mind the practical advise. I am trying to save your money and its for you to decide. So Should You Sell Options Next Couple Of Months? With trading there is no guarantee, but when markets are stable its more sensible to short options with protection. When markets are stable the theta of options will eat the premium of options as time passes and you can exit with profits. Of course trading non-directional is even better as we don’t even need to predict direction – its the job of the buyers not sellers. Well my course teaches the best possible way to trade non-directional, but its for you to decide if its worth it. Sir as usual it’s an excellent article. In the ad you still given rs.30000 is needed for non directional trade. Bit its more than 90000. Pl correct this sir. Thanks Ragunathan. Yes I need to correct that will do so within this week. I dont know why they did this. If losses was an issue SEBI should have reduced lot size in Indexes and not increased. That way people could have traded with less money and lost less. Then they can always take a call if they need to keep trading. Now the newcomers will lose more because of the increased lot size. Bad decision really.